Hamburg, December 12, 2011 – Sporting the claim “Get some serious German engineering into your game”, ROCCAT™ Studios – the Hamburg, Germany-based manufacturer of professional PC gaming devices and equipment – today announced the US launch of their gaming device line. 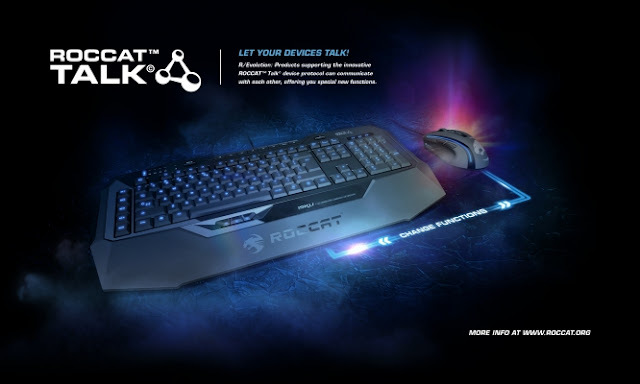 Already the brand of choice for legions of pro gamers in Europe and Asia, ROCCAT™ intends to fill a void in the crowded US gaming peripherals market by offering products with new, highly-innovative features – devices that take advantage of the some of the world’s most advanced gaming engineering. Korte sees ROCCAT™ as a premium brand built around extreme style and hyper-advanced, German-engineered performance. ROCCAT™ will make its US debut at the Consumer Electronics Show (CES) in Las Vegas, January 10-13, 2012. To mark the event, the company will unveil two of their flagship products – the ROCCAT™ Isku Illuminated Gaming Keyboard and the ROCCAT™ Kone[+] Max Customization Gaming Mouse. Plus, the company will show off ROCCAT™ Talk© – a unique technology that lets compatible devices, like the Isku and Kone[+], “talk” to one another – giving gamers a host of unprecedented advantages that let them command easier and win more. ROCCAT™ will launch its US operations January 10-13, 2012, at the CES in Las Vegas, at the Las Vegas Convention Center, South Hall 2, Booth Number 25213.